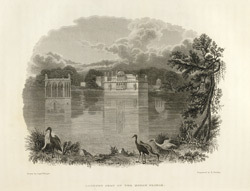 Engraving of a country seat for the Kotah Prince by Edward Francis Finden (1791-1857) and Patrick Young Waugh (1788-1829). Plate 3 of the 'Annals and antiquities of Rajast'han or the Central and Western Rajpoot States of India' published in London in 1832. The Rajput city of Kota in southern Rajasthan was founded in the 14th century within the borders of the state of Bundi; it became the capital of an independent princely state of the same name in the early 17th Century. During the reign of the Mughal Emperor Jahangir, Rao Ratan Singh, the ruler of Bundi, gave the small principality of Kota to his son, Madho Singh. The Kota fort he gained possession of was built in c. 1264 by Rajkumar Jait Singh of Bundi and contains the city palace. It is situated on the bank of the River Chambal where it meets its tributary, the Shahi Dehra. Since then Kota became a hallmark of Rajput gallantry and culture, as witnessed in the states strong painting tradition.